ANAHEIM, Calif. (AP) Matt Shoemaker finally showed off his 2016 form. Shoemaker (2-2) struck out seven and walked one. He improved to 3-1 with a 0.83 ERA lifetime against the Tigers. Shoemaker is a Michigan native who pitched at Eastern Michigan University. He said he gets a little fired up to pitch against his hometown team. The Angels scored runs against Jordan Zimmerman (3-2) in four of his six innings. 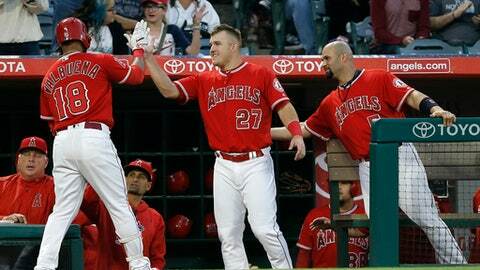 Valbuena’s solo home run started the scoring in the second and Trout’s two-run blast completed it in the eighth. Zimmerman was charged with five runs on 10 hits and three walks in his 5 1/3 innings. Valbuena and Cliff Pennington each had three hits. Andrelton Simmons and Kole Calhoun had two apiece. The Tigers looked as though they would break through first when they loaded the bases with no outs in the second inning, but Shoemaker got the next three outs. ”You have to calm yourself down in those situations and just execute pitches,” Shoemaker said. Shoemaker was never in trouble again. He retired his last 10 consecutive batters. Blake Parker, David Hernandez and Keynan Middleton completed only the second shutout of the season for the Angels. Tigers: Placed outfielder Jim Adduci on the 10-day disabled list with a right oblique strain retroactive to May 11 and reinstated J.D. Martinez from the DL. Martinez (foot sprain) was immediately placed in the lineup and batted sixth. Angels: Closer Cam Bedrosian, on the disabled list since April 22 with a right groin strain, has yet to throw off a mound. Scioscia said he still needs more long toss, but could be scheduled for the mound next week. Tigers: Daniel Norris is scheduled to make his first career appearance against the Angels. He is 2-2 with a 4.55 ERA on the season, but for his career is 7-1 with a 3.27 ERA on the road. Angels: Right-hander Ricky Nolasco (2-2) is coming off the Angels’ only 10-strikeout performance of the season. He held the A’s to two runs in seven innings on Monday, but their opening-day starter is still searching for consistency (4.31 ERA). This story has been corrected to show that Shoemaker’s record is 2-2.